Dynamic adhesion of immune cells to the vessel wall is a prerequisite for gut homing. Here, we present a protocol for a functional in vitro assay for the impact analysis of anti-integrin antibodies, chemokines or other factors on the dynamic cell adhesion of human cells using addressin-coated capillaries. Becker, E., Schramm, S., Binder, M. T., Allner, C., Wiendl, M., Neufert, C., Atreya, I., Neurath, M., Zundler, S. Dynamic Adhesion Assay for the Functional Analysis of Anti-adhesion Therapies in Inflammatory Bowel Disease. J. Vis. Exp. (139), e58210, doi:10.3791/58210 (2018). Gut homing of immune cells is important for the pathogenesis of inflammatory bowel diseases (IBD). Integrin-dependent cell adhesion to addressins is a crucial step in this process and therapeutic strategies interfering with adhesion have been successfully established. The anti-α4β7 integrin antibody, vedolizumab, is used for the clinical treatment of Crohn's disease (CD) and ulcerative colitis (UC) and further compounds are likely to follow. The details of the adhesion procedure and the action mechanisms of anti-integrin antibodies are still unclear in many regards due to the limited available techniques for the functional research in this field. Here, we present a dynamic adhesion assay for the functional analysis of human cell adhesion under flow conditions and the impact of anti-integrin therapies in the context of IBD. It is based on the perfusion of primary human cells through addressin-coated ultrathin glass capillaries with real-time microscopic analysis. The assay offers a variety of opportunities for refinements and modifications and holds potentials for mechanistic discoveries and translational applications. Cell motion is a tightly regulated process indispensable for the development and function of multi-cellular organisms, but is also implicated in the pathogenesis of a multitude of diseases1. Recently, the homing process of immune cells from the blood stream to the peripheral tissues has gained increasing attention, since it contributes to replenishment and expansion of pathogenic cells in inflamed tissues in immunologically mediated diseases2,3. In particular, homing has been shown to have translational relevance in inflammatory bowel diseases (IBD). The therapeutic anti-α4β7 integrin antibody vedolizumab interfering with gut homing has shown efficacy in large clinical trials4,5 and has been successfully used in real-world clinical practice6,7,8. Further compounds are likely to follow9,10. Similarly, the therapeutic anti-α4 integrin antibody, natalizumab, is used for the treatment of multiple sclerosis (MS)11. However, our functional understanding of the homing process in general and the mechanism of action of such therapeutic antibodies in particular is still limited. It is well established that homing consists of several steps including cell tethering and rolling with subsequent cell adhesion leading to firm arrest followed by trans endothelial migration12,13. The above-mentioned antibodies neutralize integrins on the cell surface preventing interaction with addressins on the endothelium of the vessel wall. This is thought to impede firm cell adhesion14,15. Yet, we are only beginning to understand the differential relevance of specific integrins for cell homing of distinct cell subsets. Moreover, the effects of anti-integrin antibodies on different cell subsets and dose-response associations are largely unknown leading to lots of open questions in the field of gut homing and anti-adhesion therapies in IBD. Therefore, convenient tools to address such questions are desperately needed. The effect of anti-integrin antibodies on integrin-addressin interaction has so far predominantly been evaluated by assessing binding efficacy/binding inhibition with flow cytometry or through static adhesion assays16,17,18,19,20, thus with apparent simplification and deviation from the physiological situation. We recently established a dynamic adhesion assay to study integrin-dependent adhesion of human cells to addressins and the effects of anti-integrin antibodies under shear stress2. The principle of the technique has earlier been demonstrated with mouse cells21,22. Here, it was adapted and developed to address the above mentioned translational questions, opening novel avenues to better understand the mechanisms of therapy with anti-integrin antibodies in vivo. The studies described in the following sections have been performed according to approval of the Ethics committee of the Friedrich-Alexander University Erlangen-Nuremberg. Connect rectangular capillaries to the rubber tubing by stretching the tubing on one side with small scissors and carefully inserting the capillary (approximately 0.5 cm) into the tube. Seal the connection between capillary and tube with plastic paraffin film. Coat the capillary with 20 µL of addressin (recombinant Fc chimera; 5 µg/mL addressin, e.g. MAdCAM-1, in coating buffer (150 mM NaCl + 1 mM HEPES)) or the appropriate isotype control solution using a p20 pipette (fluid will soak itself into the capillary). Then, seal the side not connected to the tubing with the plastic paraffin film and incubate for at least 1 h at 37 °C. Use a capillary filled only with the coating buffer or with the appropriate isotype control as negative control. Remove the plastic paraffin film from the tip of the capillary, empty the coating by letting the liquid soak out of the capillary on a paper towel and block capillaries for at least 1 h with 20 µL of blocking solution (1x PBS with 5% BSA) at 37 °C. Seal the open side of the capillary with plastic paraffin film. Do not remove the blocking solution before proceeding to microscopy. NOTE: These steps can be performed during the incubation periods necessary for the capillary preparation. Collect 18 mL of anticoagulated full human blood with an aseptic blood collection set from the cubital vein of volunteering persons (e.g., IBD patients and/or healthy controls) after informed written consent according to the regulations of the local ethics committee. NOTE: This step should only be performed by trained and experienced medical staff according to national and/or local regulations. Fill the blood into a 50 mL tube and dilute to a volume of 35 mL with 1x PBS. Then underlay the blood-PBS mixture with 10 mL of density gradient medium. Perform density gradient centrifugation for 15 min at 800 x g and 24 °C without brake to separate cells. Collect the peripheral blood mononuclear cells (PBMCs) by aspirating the white cell layer right on top of the density gradient medium layer (clear middle layer). Transfer PBMCs into a fresh 50 mL tube, fill up to 50 mL with 1x PBS and centrifuge for 10 min at 300 x g and 10 °C. Discard the supernatant, resuspend the cell pellet in 10 mL of 1x PBS and subsequently count cell numbers, e.g., by using a Neubauer cell counting chamber. Optional: To study the adhesion of granulocytes perform the following procedure. Otherwise, proceed with step 2.7 or 2.8. Collect the granulocyte layer (bottommost layer after density gradient centrifugation containing also the erythrocytes). Resuspend cells in 40 mL of 1x PBS. Then add 8 mL of 6% Dextran in 1x PBS, mix gently and let cells sediment for 30 min at room temperature. NOTE: The erythrocytes will sink to the bottom of the tube, while the granulocytes will stay in suspension. After 30 min, collect the supernatant, transfer into a fresh 50 mL tube and centrifuge for 6 min at 300 x g and 4 °C. Discard the supernatant and lyse the remaining erythrocytes by adding 5 mL of 0.2% NaCl in ddH2O. Incubate for 1 min. Add 5 mL of 1.4% NaCl in ddH2O and incubate for another minute. Stop the hypotonic lysis by adding 20 mL of 1x PBS and centrifuge for 6 min at 300 x g and 4 °C. Resuspend the cell pellet in 10 mL of 1x PBS. Then, count cell numbers by using a Neubauer cell counting chamber. Optional: To study the adhesion of PBMC subsets, purify different cell types or subsets (e.g., CD4+ and CD8+ T cells or CD19+ B cells) using microbeads according to the manufacturer’s protocol or by fluorescence-activated cell sorting (FACS). Otherwise, proceed with step 2.8. Centrifuge the cell suspension for 10 min at 300 x g and 10 °C. Discard the supernatant and stain cells with cell tracking dye (e.g., CFSE) according to the manufacturer’s instructions. Subsequently, centrifuge the cells for 10 min at 300 x g, and discard supernatant. Resuspend in 1x PBS, determine the cell number and centrifuge again for 10 min at 300 x g.
Discard the supernatant and resuspend the stained cell pellet in the appropriate amount of adhesion buffer (150 mM NaCl + 1 mM HEPES + 1 mM MgCl2 + 1 mM CaCl2) to obtain a suspension of 1.5 x 106 cells/mL. Then, add the appropriate amount of 100 mM MnCl2 to obtain a final concentration of 1 mM. NOTE: These cells are now ready for microscopy. Optional: Treat cells with cytokines, neutralizing antibodies or other compounds. Otherwise, proceed with step 3. Omit step 2.10 and resuspend the stained cell pellet from step 2.9 in RPMI medium (with 10% FBS and 1% Penicillin/Streptomycin) to obtain a concentration of 1.5 x 106 cells/mL. Pipette 1 mL of this cell suspension into as many wells of a 48-well plate as there are conditions to be analyzed. Always prepare one well with untreated cells to be perfused through an uncoated capillary as negative control and one well with untreated cells to be perfused through an addressin-coated capillary as positive control. For the treatment with anti-integrin antibodies, add the appropriate amount of antibody (e.g., 10 µg/mL vedolizumab) to the cell suspension. Incubate for 1 h at 37 °C. For treatment with cytokines, add the appropriate amount of recombinant cytokine (e.g., 10 ng/mL CXCL10) to the cell suspension. Incubate for 5 min at 37 °C. After incubation, harvest cells by resuspending cells several times using a p1000 pipette. Transfer cells into a 2 mL tube, rinse well again with 1 mL of 1x PBS and add to the 2 mL tube. Determine the cell number. NOTE: Incubation of adherent cell populations (e.g., monocytes) might require additional measures (e.g., treatment with trypsin) to detach cells from the plate. Centrifuge cells for 10 min at 300 x g at 10 °C. Discard the supernatant and resuspend the cell pellet in the appropriate amount of adhesion buffer to obtain a suspension of 1.5 x 106 cells/mL. Then, add the appropriate amount of 100 mM MnCl2 to obtain a final concentration of 1 mM. When pretreating with chemokines do not add MnCl2 to the cell suspension. These cells are now ready for microscopy. NOTE: The minimum volume used for the assay is dependent on the pump and tubing used. In this study, using the peristaltic pump and the tubing specified in the Table of Materials, a minimum volume of 400 µL was required. If desired and applicable (depending on cell type and yield), the cell concentration in the suspension can be increased to measure higher adhesion in a shorter period of time. Perform the above-mentioned steps with different cell populations to be compared to each other (e.g., regulatory and effector T cells isolated through magnetic bead isolation following manufacturer’s instructions as per step 2.7). Stain each population with a different dye (e.g., CFSE and FarRed) as described in steps 2.8–2.9 to be able to differentiate cell populations during microscopy. Discard the supernatant and resuspend the stained cell pellets in the appropriate amount of adhesion buffer (150 mM NaCl + 1 mM HEPES + 1 mM MgCl2 + 1 mM CaCl2) to obtain a suspension of 1.5 x 106 cells/mL. Mix equal volumes of the cell suspensions (e.g., 500 µL of regulatory T cells and 500 µL of effector T cells) to obtain a final mixed cell concentration of 1.5 x 106 cells/mL. Then, add the appropriate amount of 100 mM MnCl2 to obtain a final concentration of 1 mM. Such suspensions can subsequently be used for competitive analysis of the adhesion process by perfusing different cell populations through the same capillary. Turn on the microscope and select the appropriate filter or laser to excite the cell tracking dye(s) (e.g., 488 nm laser for CFSE), an appropriate objective (e.g., 40X) and an acquisition mode enabling time lapse imaging. Remove the plastic paraffin film from the tip of the capillary and connect the capillary with a short piece of tubing (approximately 5 cm of length) by stretching the tubing on one side with small scissors and carefully inserting the capillary (approximately 0.5 cm) into the tube. Seal the connection between the capillary and tube with the plastic paraffin film. Mount the capillary on a fixation tray (e.g., lid from a 6-well plate with a rectangular cut-out slightly shorter than the length of the capillary) and place the fixed capillary on the tray holder of the microscope, so that the capillary is in focus and ready for microscopy. Insert the rubber tubing into the corresponding notch of the peristaltic pump and place the end not attached to the capillary into the according sample tube containing the cell suspension. Insert the short tube on the other side of the capillary into a 15 mL tube to collect flow-through. Let the tubing fill with a flow rate of 500 µL per minute until the cell suspension almost reaches the capillary. Then let the capillary fill with a flow rate of 100 µL/min. NOTE: A quick filling up of the capillary ensures a regular distribution of the cell suspension inside the capillary. When the capillary is filled with the cell suspension, adjust flow rate to 10 µL/min. NOTE: These flow rates may vary, when capillaries of a different size or different peristaltic pumps are used. In this study, the flow rate of 10 µL/min was optimized for the pump and capillaries to mimic in vivo blood flow. Capture time-lapse images of the cells moving slowly through the capillary along the addressin-coated inside wall every 2 s for a total of 3 min. NOTE: Intervals and total time may vary depending on cell type and question to be addressed. Before discarding the capillary, screen the whole capillary through the eye piece of the microscope to make sure that the section shown on the video is representative. If necessary, make a second recording. Free the tubing from the pump and let the remaining fluid run back into the 2 mL tube, then disconnect the capillary and tubing from the fixation tray and continue with the next capillary. Open the time-lapse sequence with appropriate software and export the first three images (“Beginning”) and the last three images (“End”) as Tiff files. Open the three “Beginning” images in ImageJ, convert to 32 bit ('Image | Type | 32 Bit') and merge pictures ('Image | Color | Merge channels'; assign the colors red, green and blue to the different pictures). Convert composite image into RGB ('Image | Type-RGB') and save as Tiff file. Repeat with the “End” images. Note: In competitive dynamic adhesion assays with cells stained with different colors, first split the channels of the images to analyze adhesion of the different cell populations separately. Count the white cells visible in the “Beginning” and “End” composite and subtract the number of white cells in the “Beginning” from the white cells in the “End”. Note: The difference represents the number of newly adhering cells in the 3 min time interval. In the composite image, cells that moved are visible in the specific color that was assigned to the respective frame since they localize in another spot in the previous and following frame. For cells that are adherent, the red, green and blue signals in the same spot overlap to white. To better visualize the results, compile a video from the time-lapse sequences, e.g., using ImageJ. The method presented in this manuscript aims to simulate the in vivo process of human cell adhesion to the endothelial wall as closely as possible to functionally assess cell adhesion and the role of interfering antibodies. Therefore, ultrathin capillaries are coated with addressins and perfused with fluorescently labeled human cells of interest using a perfusion pump. Using live cell imaging the adhesion of human cells to the addressins can be observed in real time (Figure 1). This method is particularly suitable to elucidate the mechanisms of anti-adhesion therapies in IBD. As shown in Figure 2A, perfusion of capillaries coated with ICAM-1, VCAM-1, MAdCAM-1 and Isotype Fc chimera with human PBMCs leads to marked adhesion, when one of the three addressins is present. In contrast, adhesion to isotype-coated capillaries is minimal. Inhibition of integrin-addressin interactions using neutralizing antibodies typically leads to a marked decrease of dynamic adhesion that is absent, when isotype control antibodies are added (representatively illustrated in Figure 2B, pooled quantitative data in Figure 2C). Similarly, the impact of chemokines on integrin-affinity modulation can be investigated in this system by pre-incubation with such peptides in vitro. 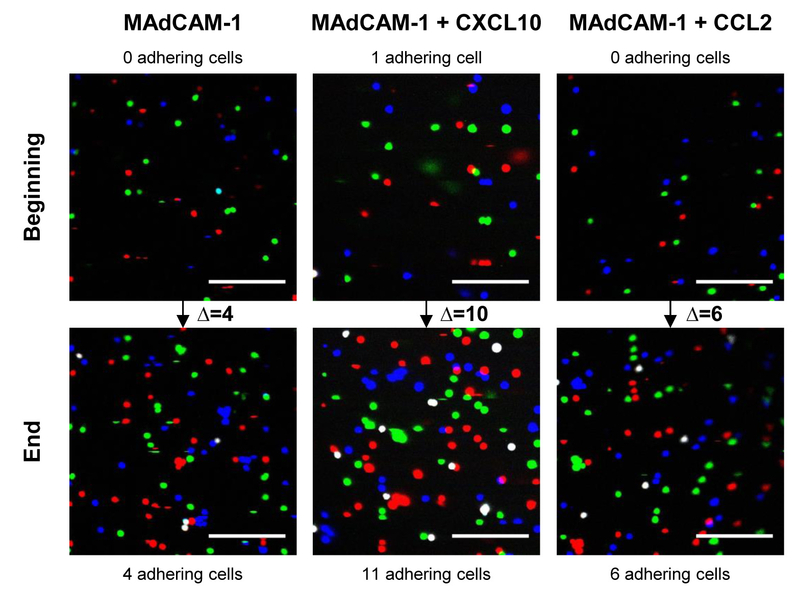 As shown by representative data in Figure 3, treatment of CD4+ human T cells with either CCL2 or CXCL10 leads to increased adhesion to MAdCAM-1 compared to untreated human cells. Figure 1: Schematic representation of the workflow. Preparation of addressin coated ultrathin capillaries and fluorescently labeled human cells (left) is followed by perfusion of cells through the capillary using a peristaltic pump (middle) and time-lapse microscopy (right). Modified with permission from reference23. Please click here to view a larger version of this figure. Figure 2: Dynamic adhesion of human peripheral blood mononuclear cells (PBMCs) from control donors to different addressins. (A) Number of newly adhering PBMCs to capillaries coated either with specific addressins or with Fc Isotype control (n = 6). (B) Representative images of dynamic adhesion in ICAM-1 coated capillaries perfused with untreated (NT) PBMCs or cells incubated with 10 µg/mL anti-CD18 antibody or 10 µg/mL IgG isotype control. Beginning: Merged first three images of the 3 min sequence; End: Merged last three images of the 3 min sequence; adhering cells are depicted white. Their numbers as well as the difference (i.e., newly adhering cells) are indicated. Scale bar = 100 µm. (C) Impact of anti-integrin antibodies (each used at a concentration of 10 µg/mL) on dynamic adhesion. Left: Number of newly adhering cells to capillaries coated with ICAM-1 and perfused with untreated, anti-CD18-treated or IgG isotype control-treated cells; Middle: Number of newly adhering cells to capillaries coated with VCAM-1 and perfused with untreated, natalizumab-treated or IgG isotype control-treated cells; Right: Number of newly adhering cells to capillaries coated with MAdCAM-1 and perfused with untreated, vedolizumab-treated or IgG isotype control-treated cells (n = 5–6). Bars indicate means with standard error of the mean (SEM). Statistical testing was performed with one-way ANOVA followed by Newman-Keuls Multiple comparison test (* p <0.05; ** p <0.01). Modified with permission from reference23. Please click here to view a larger version of this figure. 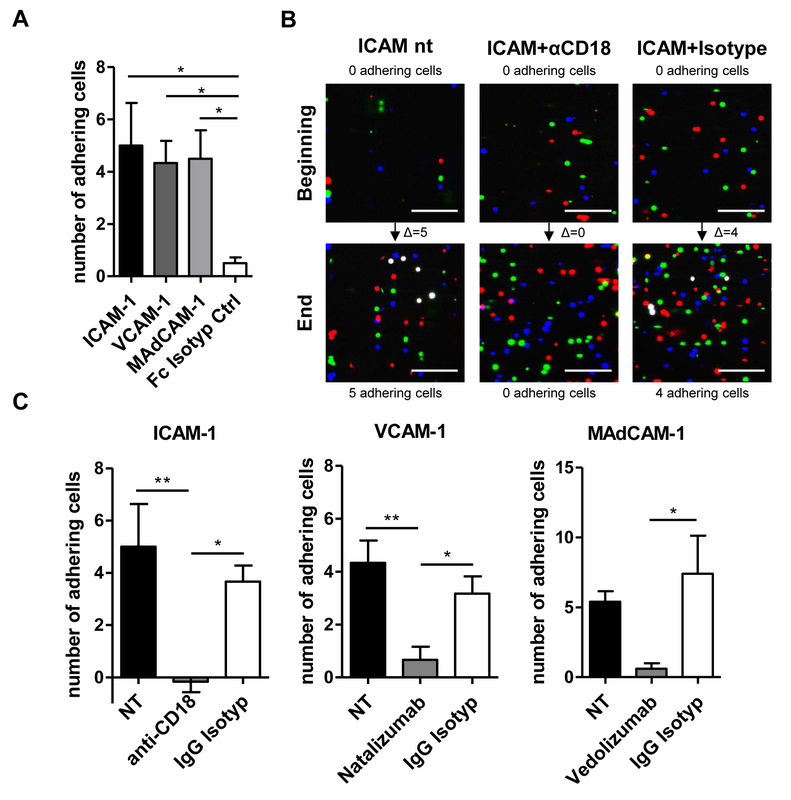 Figure 3: Chemokine-mediated dynamic adhesion of human CD4+ T cells to MAdCAM-1. Images from a representative dynamic adhesion assay in MAdCAM-1-coated capillaries perfused with untreated (NT) CD4+ T cells or cells incubated with 10 ng/mL rhCXCL10 or with 100 ng/mL rhCCL2. Beginning: Merged first three images of the 3 min sequence; End: Merged last three images of the 3 min sequence; adhering cells are depicted white. Their numbers as well as the difference (i.e., newly adhering cells) are indicated. Scale bar = 100 µm. Preincubation with chemokines leads to increased dynamic adhesion, presumably due to integrin-affinity modulation. Please click here to view a larger version of this figure. SupplementaryVideos: Movies from three minutes image sequences from MAdCAM-1 coated capillaries perfused with fluorescently labeled PBMCs. (A) Capillary perfused with untreated cells. (B) Capillary perfused with cells treated with 10 µg/mL vedolizumab. (C) Capillary perfused with cells treated with 10 µg/mL human IgG isotype control. Cell flow from bottom to top, newly adhering cells are indicated by white arrows. Please click here to download this file. The above protocol describes a useful technique to study dynamic adhesion of human immune cells to endothelial ligands. Through variation of the coated ligands, the perfused cell types or subsets, incubation with additional stimuli or different neutralizing antibodies, it has almost unlimited potential applications. Therefore, such dynamic adhesion assays may be useful to answer both fundamental questions of basic research as well as translational queries that might help to develop and optimize clinical therapy with drugs interfering with the adhesion process. The utility of the assay to investigate the effects of clinical anti-adhesion therapies has recently been demonstrated. Moreover, different cell populations expressing different types and amounts of integrins show consistent levels of dynamic adhesion to the respective addressins, supporting the validity of the assay23. On the whole, the completion of the protocol needs about 6 hours of work and presents intermediate technical challenges. Once the coating of the capillary has started, a critical issue is to avoid dehydration. This requires accurate sealing during incubation steps and careful handling of the capillaries, when exchanging solutions. In addition, the initiation of the perfusion process necessitates some caution. Due to the dead volume of the tubing, it is not feasible to fill the whole tubing with the final perfusion flow rate. On the other hand, changing the flow rate after flushing the capillary with high speed entails the risk of flow interruption leading to the possibility of static adhesion limiting the validity in regard to dynamic adhesion. Therefore, a timely switch to the final flow rate is essential. The final flow rate should be chosen dependent on the pump, tubing and capillary size used. To mimic human blood flow in high endothelial venules as closely as possible, a volume flow of 0.1 to 5 mm/s is recommended24,25. The difficulty of the assay may markedly increase, when modifications are applied. For example, analysis of specific T cell subsets might require demanding polarization or purification strategies26. Also, including the homing steps of tethering, rolling and cell activation12 into the experiment will further increase the difficulty, since it might be necessary to coat a combination of ligands to the inside of the capillaries or (pre-)treat the perfused cell population with chemo- or cytokines to account for selectin-dependent rolling and chemokine-induced cell activation and integrin affinity modulation27. However, these might be particularly interesting questions for future research, especially as the presented technique allows to functionally address such a sophisticated interaction of different molecules with human cells and ligands. As mentioned above, competitively analyzing dynamic adhesion of several differently stained cell populations in the same capillary may add another level of complexity. Moreover, it has also been demonstrated that endothelial cells can be used in fluidic systems instead of recombinant ligands28. Although it is a functional assay, the technique is limited by the reduction of complex in vivo networks to a selected set of involved molecules in vitro. This means that the effects of unknown or unexpected additional factors might be overlooked or not sufficiently considered. However, this is a frequent problem in human research, because ethical considerations often forbid mechanistic in vivo investigations29. Taken together, this protocol presents a functional assay for the analysis of integrin-dependent dynamic adhesion and anti-integrin therapies in inflammatory bowel diseases. While the basic principle is quite straight-forward and not too difficult to perform, it can be embellished and modified in several regards and has the potential to answer translational questions regarding anti-adhesion therapy in IBD. M.F.N. has served as an advisor for Pentax, Giuliani, MSD, Abbvie, Janssen, Takeda and Boehringer. M.F.N. and S.Z. received research support from Takeda and Roche. The research of CN, IA, MFN and SZ was supported by the Interdisciplinary Center for Clinical Research (IZKF) and the ELAN program of the University Erlangen-Nuremberg, the Else Kröner-Fresenius-Stiftung, the Fritz-Bender-Stiftung, the German Crohn's and Colitis Foundation (DCCV), the Clinical Research Group CEDER of the German Research Council (DFG), the DFG topic program on Microbiota, the Emerging Field Initiative and the DFG Collaborative Research Centers 643, 796 and 1181.
von Andrian, U. H., Mackay, C. R. T-Cell Function and Migration - Two Sides of the Same Coin. New England Journal of Medicine. 343, (14), 1020-1034 (2000). Zundler, S., et al. The α4β1 Homing Pathway Is Essential for Ileal Homing of Crohn's Disease Effector T Cells In Vivo. Inflammatory Bowel Diseases. 23, (3), 379-391 (2017). Binder, M. -T., et al. Similar inhibition of dynamic adhesion of lymphocytes from IBD patients to MAdCAM-1 by vedolizumab and etrolizumab-s. Inflammatory Bowel Diseases. in press (2018). Feagan, B. G., et al. Vedolizumab as induction and maintenance therapy for ulcerative colitis. The New England Journal of Medicine. 369, (8), 699-710 (2013). Sandborn, W. J., et al. Vedolizumab as induction and maintenance therapy for Crohn's disease. The New England Journal of Medicine. 369, (8), 711-721 (2013). Baumgart, D. C., Bokemeyer, B., Drabik, A., Stallmach, A., Schreiber, S. Vedolizumab Germany Consortium Vedolizumab induction therapy for inflammatory bowel disease in clinical practice--a nationwide consecutive German cohort study. Alimentary Pharmacology & Therapeutics. 43, (10), 1090-1102 (2016). Kopylov, U., et al. Efficacy and Safety of Vedolizumab for Induction of Remission in Inflammatory Bowel Disease-the Israeli Real-World Experience. Inflammatory Bowel Diseases. 23, (3), 404-408 (2017). Amiot, A., et al. Effectiveness and Safety of Vedolizumab Induction Therapy for Patients With Inflammatory Bowel Disease. Clinical Gastroenterology and Hepatology: The Official Clinical Practice Journal of the American Gastroenterological Association. 14, (11), 1593-1601 (2016). Vermeire, S., et al. Etrolizumab as induction therapy for ulcerative colitis: a randomised, controlled, phase 2 trial. Lancet. 384, (9940), London, England. 309-318 (2014). Vermeire, S., et al. Anti-MAdCAM antibody (PF-00547659) for ulcerative colitis (TURANDOT): a phase 2 randomised, double-blind, placebo-controlled trial. Lancet. 390, (10090), London, England. 135-144 (2017). Miller, D. H., et al. A Controlled Trial of Natalizumab for Relapsing Multiple Sclerosis. New England Journal of Medicine. 348, (1), 15-23 (2003). Ley, K., Laudanna, C., Cybulsky, M. I., Nourshargh, S. Getting to the site of inflammation: the leukocyte adhesion cascade updated. Nature Reviews. Immunology. 7, (9), 678-689 (2007). Ley, K., Rivera-Nieves, J., Sandborn, W. J., Shattil, S. Integrin-based therapeutics: biological basis, clinical use and new drugs. Nature Reviews. Drug Discovery. 15, (3), 173-183 (2016). Wyant, T., Yang, L., Fedyk, E. In vitro assessment of the effects of vedolizumab binding on peripheral blood lymphocytes. mAbs. 5, (6), 842-850 (2013). Fischer, A., et al. Differential effects of α4β7 and GPR15 on homing of effector and regulatory T cells from patients with UC to the inflamed gut in vivo. Gut. 65, (10), 1642-1664 (2016). Wyant, T., Estevam, J., Yang, L., Rosario, M. Development and validation of receptor occupancy pharmacodynamic assays used in the clinical development of the monoclonal antibody vedolizumab. Cytometry. Part B, Clinical Cytometry. 90, (2), 168-176 (2016). Tidswell, M., et al. Structure-function analysis of the integrin beta 7 subunit: identification of domains involved in adhesion to MAdCAM-1. Journal of Immunology. 159, (3), Baltimore, Md. 1497-1505 (1997). Soler, D., Chapman, T., Yang, L. -L., Wyant, T., Egan, R., Fedyk, E. R. The Binding Specificity and Selective Antagonism of Vedolizumab, an Anti-α4β7 Integrin Therapeutic Antibody in Development for Inflammatory Bowel Diseases. Journal of Pharmacology and Experimental Therapeutics. 330, (3), 864-875 (2009). Parikh, A., et al. Vedolizumab for the treatment of active ulcerative colitis: a randomized controlled phase 2 dose-ranging study. Inflammatory Bowel Diseases. 18, (8), 1470-1479 (2012). Wendt, E., White, G. E., Ferry, H., Huhn, M., Greaves, D. R., Keshav, S. Glucocorticoids Suppress CCR9-Mediated Chemotaxis, Calcium Flux, and Adhesion to MAdCAM-1 in Human T Cells. The Journal of Immunology. 196, (9), 3910-3919 (2016). Nussbaum, C., et al. Sphingosine-1-phosphate receptor 3 promotes leukocyte rolling by mobilizing endothelial P-selectin. Nature Communications. 6, (2015). Pruenster, M., et al. Extracellular MRP8/14 is a regulator of β2 integrin-dependent neutrophil slow rolling and adhesion. Nature Communications. 6, (2015). Binder, M. -T., et al. Similar Inhibition of Dynamic Adhesion of Lymphocytes From IBD Patients to MAdCAM-1 by Vedolizumab and Etrolizumab-s. Inflammatory Bowel Diseases. 24, (6), 1237-1250 (2018). Wang, L., et al. Vessel Sampling and Blood Flow Velocity Distribution With Vessel Diameter for Characterizing the Human Bulbar Conjunctival Microvasculature. Eye & Contact Lens. 42, (2), 135-140 (2016). House, S. D., Johnson, P. C. Diameter and blood flow of skeletal muscle venules during local flow regulation. The American Journal of Physiology. 250, (5 Pt 2), H828-H837 (1986). Zundler, S., Neurath, M. F. Pathogenic T cell subsets in allergic and chronic inflammatory bowel disorders. Immunological Reviews. 278, (1), 263-276 (2017). Zundler, S., Becker, E., Weidinger, C., Siegmund, B. Anti-Adhesion Therapies in Inflammatory Bowel Disease-Molecular and Clinical Aspects. Frontiers in Immunology. 8, (2017). Zhou, Y., Kucik, D. F., Szalai, A. J., Edberg, J. C. Human Neutrophil Flow Chamber Adhesion Assay. Journal of Visualized Experiments: JoVE. (89), (2014). Zundler, S., et al. Blockade of αEβ7 integrin suppresses accumulation of CD8(+) and Th9 lymphocytes from patients with IBD in the inflamed gut in vivo. Gut. 66, (11), 1936-1948 (2017).